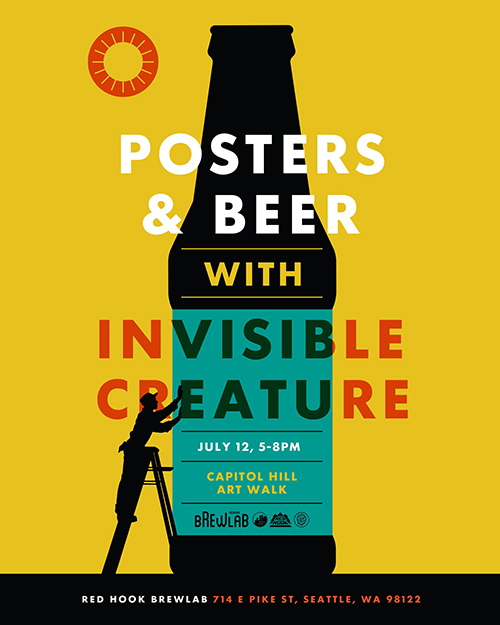 We are excited to announce that July's Art Walk will feature Invisible Creature! The event is FREE to attend and we'll be featuring a new small-batch release so all the more reason to stop by! Founded in 2006 by Don & Ryan Clark, Invisible Creature is a world-renown multi-disciplinary design and illustration studio based out of Seattle, Washington. IC has had the honor of receiving 4 Grammy nominations for music packaging, and has worked with clients such as Target, Disney, NASA, USPS, LEGO, Nike, Wired, Warby Parker & more. Their client list also reads like a veritable who's-who of the music world, including Foo Fighters, Kendrick Lamar, Chris Cornell, Nirvana, Alice In Chains, Lecrae and countless others. Invisible Creature also designs and curates their own line of products for both children and adults alike. Their toys and books have been sold in Barnes & Noble, Anthropologie, Barneys New York, SF MOMA, Nordstrom and many more. Don & Ryan will be showing 20 gig posters and will have a select amount of them for sale at the Capitol Hill Artwalk at Redhook Brewlab on July 12th! Stop by for a pint and to check out their amazing work!